Rouge Valley Quilters' Guild: Raffle Quilt Completed! As we are all enjoying the summer, the Quilt Show Committee members are working hard in the background, mostly during the rainy days, to fulfill the Quilt Show requirements. We are pleased to present to all Guild members the 2014 raffle quilt, Spring Breeze, which was designed, pieced and quilted by our own Lisette Léveillé, winner of the 2012 McCall's Design Star Challenge. Please click the photo to see it larger. Quilt Appraiser Judy Lyons has appraised the quilt at a market value of $1700. The raffle draw will be held on April 6, 2014, in the final hour of our quilt show, Rhapsody of Quilts, at the Pickering Recreation Complex on Valley Farm Road. The front of quilt is made up entirely of batik fabrics from the Cantik Batiks collection. 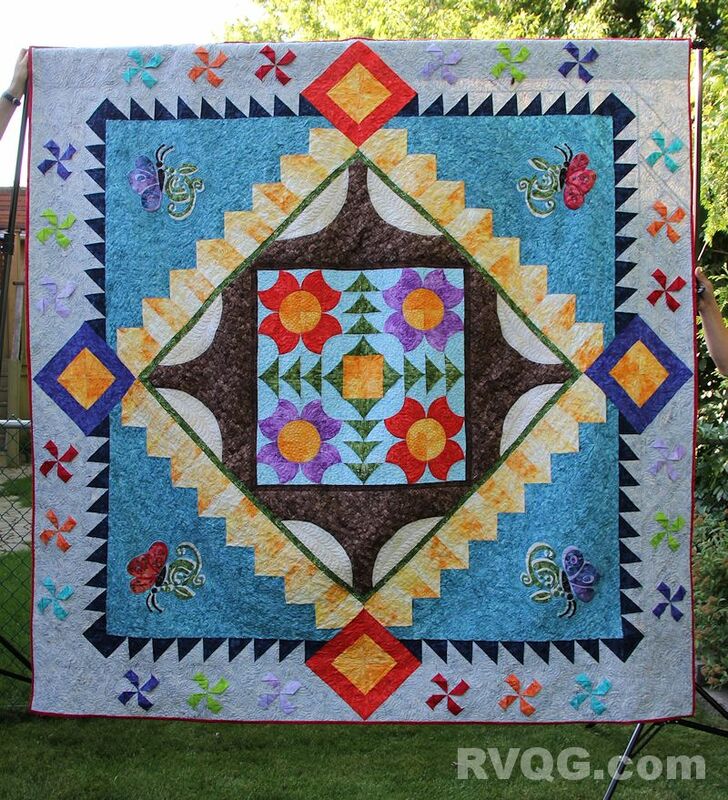 A number of techniques were used in the quilt: piecing, raw edge appliqué, strip weaving, dimensional pinwheels and flying geese, and free motion quilting. Look forward to seeing it displayed at the September Guild meeting. Members will also be able to pick up raffle tickets to sell, along with postcards for our quilt show. For anyone attending the Quilts at the Creek event this weekend, Lisette will also present the Spring Breeze Quilt during her trunk show on August 10th. For more information about Quilts at the Creek, please click here. We hope everyone is enjoying their summer. See you in September!